This is the stable version, checked on 2 November 2015. Template/file changes await review. The Guardian can create guilds. A guild is a group of players with similar interests and ideas when it comes to the interplay. With the right guild is always pleasant company and help each other in leveling or the fulfillment of quests. Its own guild, you can create at level 40 for 200,000 Yang at Guardian. In the last 24 hours you must not have been a member or leader of a guild, and the desired name can not be forgiven. The name can be a maximum 12 characters. Ring of Successor (for 95 DR in Item-Shop), each time a guild member to the new leader. But the new leader must be at least level 40 and accept the surrender. After that, the old leader can left the guild, without being dissolved. However you want to completely delete the guild, so you have to talk to the Guardian in his own kingdom, and therein select the corresponding function. The guild leader can acquire a Guild Land and construct buildings on it. The number of Guild Land is limited and only the (timely) which have the strongest guilds. However, the Blacksmiths and Alchemists can be used by all players. 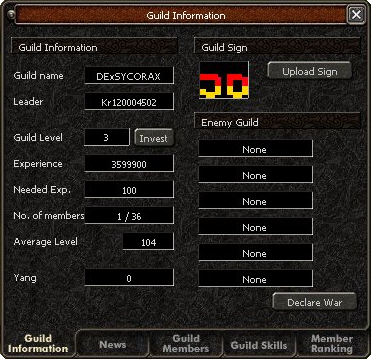 The leader of a guild can upload a guild logo (also guild characters) once the guild reaches level at least 3 is. It will then appear left of the guild name. You can either one of the preset 100 logo (shown right and below) use or your create a own logo (eg color). It must the size 16x12 pixels and the ending .jpg, .gif or .bmp have. When creating your own guild logos you also have the ability to make parts of the logo transparent. The logo itself must be created to the others in the folder "upload" directory in Metin2. Upload image below in the window "Guild Information" (ALT + G to open) then it is ready to upload. If necessary, you must click Refresh again. If you create your own guild logo, it is possible to make parts of the image transparent. It is not enough the game but to save the logo .gif with transparency. Pixels to be transparent, must be filled with pink (color code # FF00FF). It is recommended as an image format choose .bmp for transparent guild logos, as there are so no color distortion. Otherwise, it could be that the Pinken areas are seen as the Pink ingame, instead of being transparent. In the rights administration the leader has the opportunity to assign various rights. 14 ranks he may individually designate and each assign different rights. The leader has always all rights, they cannot be removed. New guild members get a default rank without rights. This right allows members to invite other players (without guild) in the guild. To invite other players in the guild, you have to make right click on the player and click in the top menu that appears Guild Invitation. The player receives a message where he can decide whether he wants to in the guild or if he does not want it. This right allows members other members from the guild to dismiss. Therefore, it should only be given to the members that you also familiar. Dismissing goes similarly to the friend list: Mark the guild member and click at the bottom on the trash can. This right allows members to write announcements on the "black board" which remain permanently at the top. Addition one must put an ! in front of the message. Besides the writer himself the leader can always delete messages. With this right the guild members can use during a guild war guild skills. It should be taken that the guild skills only encompass each the triggering player. Anyone who will benefit from the guild skills in guild wars, therefore must be set to the right. The guild leader can ask Guild Wars or accept Guild War requests from other guild leader. Both guilds need at least 8 members to perform a guild war. Guild wars are fought usually to measure the strength of their own guild with another. If you win a GK gets the guild for this ranking points. Guild Wars can therefore also be used for leveling the own guild. 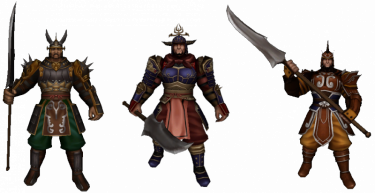 There are three types of guild wars. This type of war is played on a normal map. The enemy can be anywhere (except in the safe zones) attacked and killed. The winner is the Guild has achieved within 30 minutes the most points. After each death of the opponent, the guild receives as many points as the level of the slain. Important: During a field guild war, members receive no hunting bonus and no experience points or items when you kill monsters. Once such a guild war has been accepted, each member of the guild gets on his quest scrolls a request, if it wants to join the guild war. If the question is answered with "Yes", you will be automatically teleported to an special extra map, one guild in the northwest, the other to the southeast. Who has killed 100 enemies first, wins. Leaving the Arena, the guild battle for the player is over. Once such a guild war has been accepted, each member of the guild gets on his quest scrolls a request, if it wants to join the guild war. If the question is answered with "Yes", you will be automatically teleported to an special extra map. There you have to bring the flag of the enemy guild to "base" own. The carrier of the flag is much slower and the others have to protect him, so we can win this war only with team play. The guild can be as a character leveled through experience points. The required experience points must be donated. Every guild member can donate experience points. With each level up the guild gets a skill point for the guild skills well as space for two additional members and 100 dragon ghost. The currently highest achievable level is at 20. Per guild level you can invest a point in a guild skill, but a maximum of 7 points (Master) per skill. Since the maximum guild level is 20, you can only have 2 master skills. The last skill will then only 5 points. To use a guild skill is needed but some of the dragon ghost. This however will not charge all by itself, it must be filled with 100 Yang per dragon ghost. 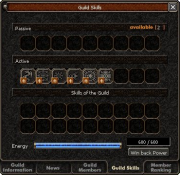 Active Guild skills can be used only in guild wars. But the bonus is only effective for the triggering player. Popular with all Class is "Rage of Dragon God" and "Casting Aid" because it accelerates all skills. Other guild skills are very class dependent in their importance. 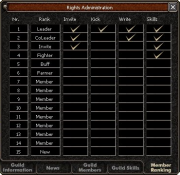 Passive Guild Skills are not yet implemented in the game. This page was last modified on 2 November 2015, at 22:58. This page has been accessed 51,291 times.